Matter is made up of atoms. Once thought to be the smallest building blocks of matter, we now know that atoms can be broken up into even smaller pieces, known as protons, electrons, and neutrons. Each atom consists of a dense core of positively charged protons and uncharged (neutral) neutrons. This core is known as the nucleus. It is surrounded by a "cloud" of much smaller, negatively charged electrons. These electrons orbit the nucleus in distinct energy levels. To move to a higher energy level, an electron must absorb energy. When an electron falls to a lower energy level, it gives off energy. Most atoms are neutral -- that is, they have an equal number of positive and negative charges, giving a net charge of 0. For this to occur, the number of protons must equal the number of electrons. In certain situations, however, an atom may gain or lose electrons. In these cases, the atom as a whole is no longer neutral, and we call it an ion. If an atom loses one or more electrons, it has a net positive charge, and is known as a positive ion. If, instead, an atom gains one or more electrons, it has a net negative charge, and is therefore called a negative ion. Like charges repel each other, while opposite charges attract each other. In physics, we represent the charge on an object with the symbol q. Charge is a fundamental measurement in physics, much as length, time, and mass are fundamental measurements. The fundamental unit of charge is the Coulomb [C], which is a very large amount of charge. Compare that to the magnitude of charge on a single proton or electron, known as an elementary charge, which is equal to 1.6*10-19 coulomb. It would take 6.25*1018 elementary charges to make up a single coulomb of charge! Question: An object possessing an excess of 6.0*106 electrons has what net charge? Certain materials allow electric charges to move freely. These are called conductors. Examples of good conductors include metals such as gold, copper, silver, and aluminum. In contrast, materials in which electric charges cannot move freely are known as insulators. Good insulators include materials such as glass, plastic, and rubber. Conductors and insulators are characterized by their resistivity, or ability to resist movement of charge. Materials with high resistivities are good insulators. Materials with low resistivities are good conductors. Semiconductors are materials which, in pure form, are good insulators. However, by adding small amounts of impurities known as dopants, their resistivities can be lowered significantly until they become good conductors. Materials can be charged by contact, or conduction. If you take a balloon and rub it against your hair, some of the electrons from the atoms in your hair are transferred to the balloon. The balloon now has extra electrons, and therefore has a net negative charge. Your hair has a deficiency of electrons, therefore it now has a net positive charge. Much like momentum and energy, charge is also conserved. Continuing our hair and balloon example, the magnitude of the net positive charge on your hair is equal to the magnitude of the net negative charge on the balloon. The total charge of the hair/balloon system remains zero (neutral). For every extra electron (negative charge) on the balloon, there is a corresponding missing electron (positive charge) in your hair. This known as the law of conservation of charge. Conductors can also be charged by contact. If a charged conductor is brought into conduct with an identical neutral conductor, the net charge will be shared across the two conductors. Question: If a conductor carrying a net charge of 8 elementary charges is brought into contact with an identical conductor with no net charge, what will be the charge on each conductor after they are separated? Answer: Each conductor will have a charge of 4 elementary charges. Question: What is the net charge (in coulombs) on each conductor after they are separated? A simple tool used to detect small electric charges known as an electroscope functions on the basis of conduction. 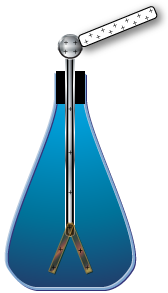 The electroscope consists of a conducting rod attached to two thin conducting leaves at one end, and isolated from surrounding charges by an insulating stopper placed in a flask. 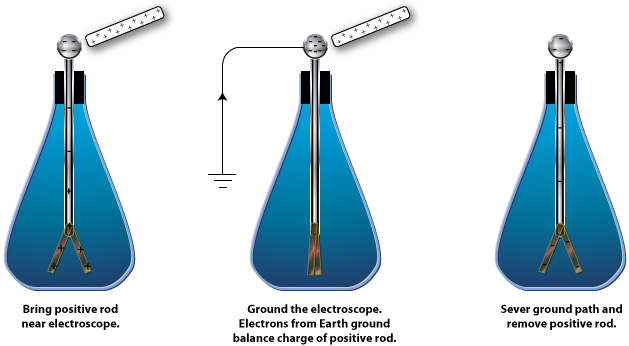 If a charged object is placed in contact with the conducting rod, part of the charge is transferred to the rod. Because the rod and leaves form a conducting path, and like charges repel each other, the charges are distributed equally along the entire rod and leaf apparatus. The leaves, having like charges, repel each other, with larger charges providing greater leaf separation! Conductors can also be charged without coming into contact with another charged object in a process known as charging by induction. This is accomplished by placing the conductor near a charged object and grounding the conductor. To understand charging by induction, we must first realize that when an object is connected to the Earth by a conducting path, known as grounding, the Earth acts like an infinite source for providing or accepting excess electrons. To charge a conductor by induction, we first bring it close to another charged object. When the conductor is close to the charged object, any free electrons on the conductor will move toward the charged object if the object is positively charged (since opposite charges attract) or away from the charged object if the object is negatively charged (since like charges repel). If the conductor is then "grounded" by means of a conducting path to the Earth, the excess charge is compensated for by means of electron transfer to or from Earth. Then the ground connection is severed. When the originally charged object is moved far away from the conductor, the charges in the conductor redistribute, leaving a net charge on the conductor as shown below. You can also induce a charge in a charged region in a neutral object by bringing a strong positive or negative charge close to that object. In such cases, the electrons in the neutral object tend to move toward a strong positive charge, or away from a large negative charge. Though the object itself remains neutral, portions of the object are more positive or negative than other parts. In this way, you can attract a neutral object by bringing a charged object close to it, positive or negative. Put another way, a positively charged object can be attracted to both a negatively charged object and a neutral object, and a negatively charged object can be attracted to both a positively charged object and a neutral object. For this reason, the only way to tell if an object is charged is by repulsion. A positively charge object can only be repelled by another positive charge, and a negatively charged object can only be repelled by another negative charge.